CHICAGO — Many productions of Wagner’s “Die Walküre” stage the “Ride of the Valkyries” scene as a rowdy reunion. We see eight Valkyrie sisters, who arrive on their flying steeds, assemble at a mountaintop to greet one another giddily. Of course, these warrior maidens have weighty responsibilities. At the command of their father, Wotan, they must bring the bodies of fallen heroes to Valhalla, revive them, and then press them into service defending this fortress of the gods. That’s what the director David Pountney emphasizes in his very theatrical new production of “Die Walküre” for the Lyric Opera of Chicago, the second installment of the company’s complete “Ring” cycle, which began last season with a new “Das Rheingold.” I attended Friday’s performance. In this staging, the bloodied bodies of the fallen are everywhere: hanging like corpses on a huge rope net at the back of the stage; lying limp on surgical tables; stuffed in body bags tethered to the horses of Valkyries, who deposit them with a thud on the ground. This place is a combination sweatshop and emergency ward. The grind has become routine for these boisterous, singing Valkyries, in their crimson-red work dresses, who sponge down the dead bodies, cleanse limbs with water hoses, and try to slap them awake. 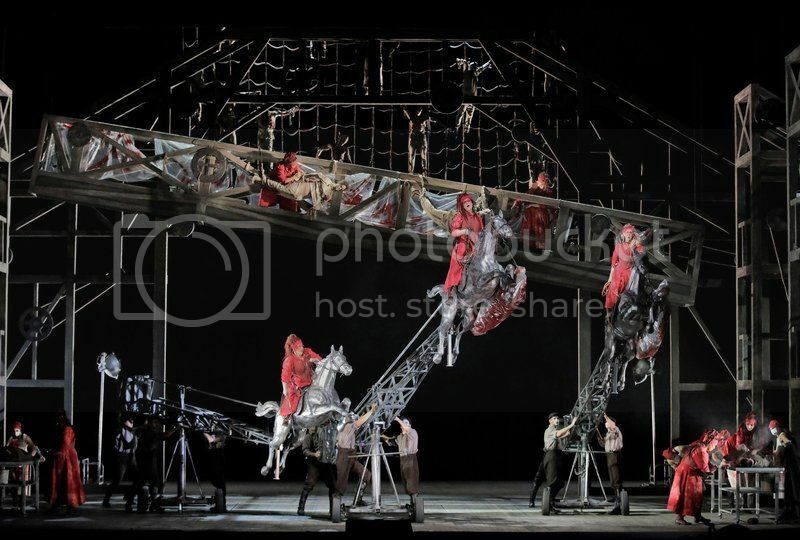 Their flying steeds here become metal horses on long-armed cranes that rise and fall and roll on wheels — operated by a visible crew of stagehands. The conceit of Mr. Pountney’s “Ring” involves a behind-the-scenes look at a performing troupe presenting a show in an old theater. We see the mechanics of all the stage tricks. There is resonance to this concept. The stories of the old myths and legends, including Wagner’s “Ring” operas, have been told many times before. We are watching these players tell this one again. The production is full of entertaining touches and striking imagery. If Mr. Pountney has any particular interpretive take on Wagner’s work, I didn’t see it; the same was true of his “Rheingold.” But the staging is certainly theatrical, and Mr. Pountney lays out the story clearly. He also excels at drawing compellingly acted performances from a strong cast, starting here with the soprano Christine Goerke, an arresting Brünnhilde. In the time since her first staged Brünnhilde in Toronto in early 2015 Ms. Goerke has made this role her own. (She will sing it when the Metropolitan Opera revives Robert Lepage’s “Ring” next season.) That her singing on Friday was so sumptuous, powerful and exciting was no surprise. Her Valkyrie war cries rang with steely brilliance; her frantic pleas to her sisters to protect her from Wotan’s wrath had tremulous intensity. She brought disarming vulnerability to the moments when this feisty Brünnhilde was caught up in emotional confusion, especially the long scene in Act II when Wotan unburdens himself to his favorite child and tells the whole sorry saga of the mistakes he made trying to gain more power. The bass-baritone Eric Owens is a magnificent Wotan. His first crack at the role came last season here with the Lyric Opera’s “Rheingold.” Though that performance had dignity and vigor, vocally he sounded a little underpowered. That was not a problem during Friday’s “Walküre.” With a stentorian voice and crisp diction, he sent Wotan’s phrases soaring into the house. And this god’s dilemma, the way he has enslaved himself, as he tells Brünnhilde, by finagling with covenants he is supposed to enforce, came through achingly during this heartbreaking scene. As presented here, Wotan and his wife, Fricka (the rich-voiced mezzo-soprano Tanja Ariane Baumgartner), could be a wealthy robber baron in the late 19th century and his entitled-acting spouse. If he appealing tenor Brandon Jovanovich lacked a little vocal heft as Siegmund, he sang with burnished sound and deep feeling, and conveyed the sadness of a rootless young person who does not even know he’s a demigod, the son of Wotan. The impressive soprano Elisabet Strid, as Sieglinde, sang with radiant, focused sound and poignant expressive shadings. She and Mr. Jovanovich were profoundly moving during Act I as these long-separated twins realize their connection and fall helplessly in love. Mr. Pountney made a bad call in his staging by having Sieglinde’s bullying husband Hunding (the bass Ain Anger in a menacing performance) chain her to the tree in his hut when he’s away. No physical restraint keeps miserable Sieglinde in this abusive marriage. She is terrified. But Hunding has also beaten her down, made her feel like a powerless nobody. Andrew Davis conducted an uncommonly warm and flowing performance of Wagner’s score — almost too much so. There were stretches when subdued passages, for all the beauty of the playing, lost suspense and tension. But the episodes of high drama had plenty of vigor and clarity. And perhaps the restraint Mr. Davis brought to bear balanced out the theatricality of the staging to good effect. Looks pretty good to me. The horses are recognisably equine. Sounds like he's gone to town on the Valkyries and the dead, but there's a lot of music, and a need for something to be happening on stage. The idea of showing the war dead on stage during the Ride of the Valkyries is not original with Pountney; it goes back at least to Chereau's Bayreuth staging of 1976. The Valkyries are carrying out Wotan's wishes, to bring the dead heroes of human wars to Valhalla to help defend it against Alberich's hordes. This, at least, is true to the letter as well as the spirit of Wagner's work. In Act 2 Wotan states his intentions clearly to Fricka and Brünnhilde, saying he provokes those wars himself to recruit Valhalla's defenders. Perhaps the audience needs to see for itself what this means, and what it says about Wotan's character and Brünnhilde's. "But nothing comes off very well, and the staging is a mishmash of style accompanied by moments of high camp. Certainly the sight of a Wotan dressed in a frock coat, shirt and tie and gray pants singing next to a Brünnhilde in armor and wearing a helmet is one of the more amazing conceptions in the history of Wagnerian staging." That's pretty much how I feel about the Chereau Bayreuth Ring cycle. But not every idea of Chereau's staging is trash, and he often got good acting performances from his singers. His "House of the Dead" for the Met was extraordinary, in a good way. RIP. His "House of the Dead" for the Met was extraordinary, in a good way. RIP. It was one of the better-produced scenes in the Melbourne Ring (director Neil Armfield, who did the Hamlet in another contemporary thread). The Valkyries descended from the skies, and attached the fallen warriors to slings which were then raised into the flies.